Provides valuable nutrients : Like other varieties of honey citrus honey also contains trace amounts of minerals such as Zinc, calcium, boron, selenium, manganese, copper, sodium, magnesium and potassium. USDA food approved food bags.The glass jar in the picture is used only for color identification and is not included. Enjoy our orange blossom honey! We move our bees on tractor & semi- trailer trucks back and forth between Florida and North Dakota depending on the season. California Orange Blossom Honey straight from the honeycomb. The bees created this honey while enjoying the sweet scent of orange blossom nectar from a huge California Orange Grove. With this delicate flavor of citrus/oranges, it makes the perfect substitute for cane sugar in your food, tea or coffee. Gunters Honey Orange - 16 ounce Glass Jar. This honey is orange blossom honey freshly extracted. Raw liquid honey may begin to crystallize in cool conditions.This honey is never heated or filtered thus preserving all the natural benefits. This is no joke. Orange Honey is a light and aromatic honey gathered from the orange blossoms. It is produced exclusively from the “California Orange Blossom” allowing it to have a citrus aroma and a rich taste. Orange Honey is one of the most flavorful types of honey. Pure Unprocessed Honey- Raw Imported Honey- Product of Lebanon. It is perfect to use as a sweetener in things like tea, fruit smoothies, or juices. Many people are unaware of honey’s healing properties. In March we put our bees in the blooming orange groves in Florida. This Orange blossom honey has the bouquet aroma and taste that is unique only to orange blossom honey. 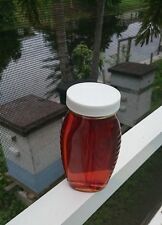 This honey is light amber in color & has the unique orange blossom flavor and odor. Eucalyptus Macadamia Mimosa. Clover Sunflower Orange Blossom. Contains 6 different 4 oz bottles of honey. Light golden in color, this floral honey is loved by adults and children for its mild sweetness. Perfect in everything from tea to yogurt. Likewise, the white foam often seen around the rim of the honey bottle is not cause for concern – it is not mold. The foam can happen when the honey is bottled. Honey should be kept covered in a dry place at room temperature. Orange Blossom Honey is made by the bees from Florida orange blossom nectar. This honey is a rare find. The citrus greening is giving orange trees a really difficult. Every year the bees have more difficulty producing this rare Florida favorite. (Air tight container). Most honey will crystallize eventually if it is truly raw, taste does not change, just a different texture. Our honey may contain small amounts of pollen and wax that make their way to the top of the jar. Wildflower Honey is a robust, delicious honey derived from a wide variety of blossom and flowers from mountains of California.Busting with traditional honey flavor, it’s darker in color and therefore contains more than its fair share of antioxidants and minerals.But don’t eat it just because it’s healthy; eat it because it tastes great! 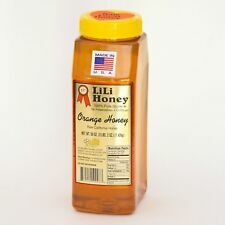 Our Orange Blossom Honey is currently sold in 12 oz bottles with a screw on lid. Orange Blossom Honey - Liquid Gold. Enjoy our Orange Blossom Honey! Likewise, the white foam often seen around the rim of the honey bottle is not cause for concern – it is not mold. Sandt’s honey is kosher certified. Pure & Unfiltered Raw golden honey is a general purpose light golden honey for all occasions, table use, cooking or baking. Gathered from the nectar of orange tree blossoms, this Monarch's Choice orange blossom honey is perfect for your bakery or restaurant! This pure honey is collected from sweet honeycomb and is free from unwanted additives. This light, flowery orange blossom honey is delicate yet flavorful. This honey is versatile and works with any cheese, especially blues. Taken from apiaries around Murcia, on Spain's eastern coast, this is a beautiful honey used to top cheeses, fruits, or yogurt. Our Antioxidant Raw Honey is the finest honey straight from the beekeeper. It is creamy, smooth, and spreadable with a taste that is utterly extraordinary! We do not feed our bees syrup during honey flow season! Raw Orange Blossom Honey - Unfiltered and Unpasteurized from Florida's Beekeepers (12lb Gallon). | Ingredients: Orange Blossom Honey. You may also be interested in. Raw Orange Blossom Honey - Unfiltered and Unpasteurized from Florida's Beekeepers - 3lb Jug (48oz). Trending at $29.40eBay determines this price through a machine learned model of the product's sale prices within the last 90 days. Our process is what makes us unique. Nor do we add extenders, additives or anything at all. Every bottle of Sandt’s honey is all genuine, pure honey. One might as well be eating processed corn syrup. Bee Raw Honey vials. 9 vials approx 3 oz each. Orange Blossom, Holly Berry, Blueberry, Buckwheat, Sourseed, Wild Raspberry, Star Thistle, Sweet Yellow Clover. All Raw Varietal Real Honey. Condition is New and Box is sealed. Shipped with USPS Priority. Size: Large - Net Weight: 648g. When you are trying to be healthy but have a sweet tooth, it's very difficult to fulfill your cravings. Orange Blossom Honey is a golden, citrus-scented honey collected from the blossoms of Lebanon's orange citruses. 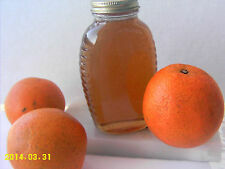 We like to call this raw Florida Orange Blossom honey "Liquid Gold" to keep in your pantry! The sweetest of the honey varietals in the Beekeeper's Daughter line, this honey has a bold flavor and strong aroma of orange blossoms. Gluten Free. Untreated, unfiltered and unheated. All-natural raw honey withhints of spring orange blossoms. Ryan Smith has always been fascinated with bees and honey. Even in college, he went on a field trip to the beehives with an entomology class he was not even in! WILDFLOWER PREMIUM Local Honey 100% Organic & Pure Unfiltered -. All of my honey is made naturally, no synthethic ingredients are added. Just 100% Pure Natural Honey from California. Our bees love their honey and I know you will too! Wildflower Honey is richer and darker in taste and color, while. Likewise, the white foam often seen around the rim of the honey bottle is not cause for concern – it is not mold. The foam can happen when the honey is bottled. New sealed fresh until 2021. Gunter's Pure Orange Blossom Honey is a tasty treat that delights anything. you can add it to your tea or anything else. Enjoy Gunter's Pure Orange Blossom Honey. | Ingredients: 100% Pure Honey. You may also be interested in. Dutch Gold Honey Orange Blossom Honey - Case of 6 - 16 oz. Orange Blossom honey a popular varietal of honey and is only produced by bees during the spring when orange trees blossom. Dutch gold. Certified Kosher by The Union of Orthodox Jewish Congregation. Baby Products. Honey Straws, Unfiltered Pure Raw, All Natural Energy, 2 Boxes Of 12, WEEKS HONEY FARMS, 60g. All Natural Energy. Healthier than "energy drinks". Quick burst of energy. Zero fat grams. Delicious, totally natural food source with pollen. Pail with an easy-to-use pour spout, this honey is a convenient and naturally-sweet way to enrich your favorite recipes. Gathered from the nectar of orange tree blossoms, this Monarch's Choice orange blossom honey is perfect for your bakery or restaurant! HONEY ~ Pure All Natural Raw Grad A- ORANGE BLOSSOM 2LB JAR MADE BY CALIFORNIA BEES.